Quarterback Colin Kaepernick opted out of his deal with the San Francisco 49ers last March, and went unsigned for the entirety of the 2017 season. That, reportedly, may not have been because of his playing ability. Testimony from witnesses under deposition in Kaepernick's collusion case against the NFL and "internal franchise documents generated as part of the free-agency evaluation process" indicated that multiple teams viewed Kaepernick as good enough to be a starting quarterback, Pro Football Talk reported Monday, citing a source with knowledge of the situation. 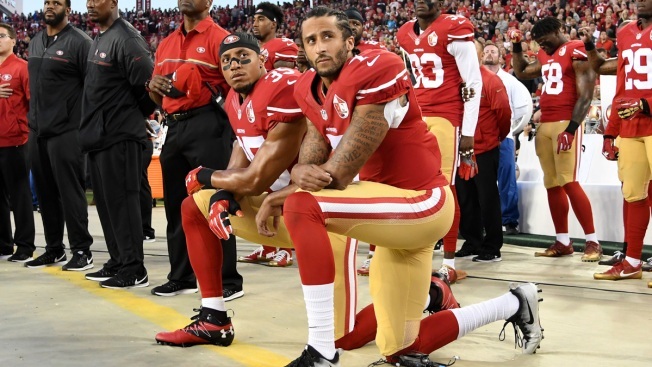 Kaepernick filed a grievance under the NFL's collective bargaining agreement in October, alleging that he was unsigned after first sitting, then kneeling, during the national anthem to protest police brutality and racial inequality throughout the 2016 season. He started 11 games in 2016, throwing for 2,241 yards, 16 touchdowns, and four interceptions. His interception percentage (1.2 percent) was sixth-lowest among starting quarterbacks (minimum 10 starts) that year, and he finished 17th in passer rating (90.7).